megyu,in: ★Magic Hour & Farewell Party. ★Magic Hour & Farewell Party. Here, id like to talk about last weekend. 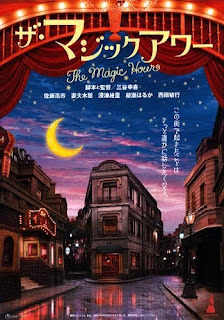 It was kind a little busy day, though i went to the theater with my mom in the morning and saw the brand new movie "Magic Hour". It was really funny and move. The story is about Gang in a small town 守課護-shukago. It was been ages since i had gone out with my mom last time, though i was happy that she had a fun time there, too! The picture is from the Movie " Magic Hour"
If you have time, please check this out!